The Juve B team finally kicked off their maiden voyage in Serie C (Girone A) with a home tie against a well seasoned Alessandria side. The opponents just missed out on promotion last term and were clearly going to represent a formidable challenge to Zironelli and his young squad. Del Favero was the star of the show for the home side, with a series of top drawer saves which helped to keep us in the game. Ultimately it was not enough as we succumbed to a 1-2 defeat. Still plenty of positives to take from the game, for it was not a one sided affair. Perreira looked in fine form, despite missing the penalty which fleet footed fullback Zappa was on hand to tuck away. We have to understand that to play against Juve will be for most opponents the biggest game of their lives. Of course league standing is the main aim, but to say they have played, even beaten Juventus will live long in the memory. Which translates to a baptism of fire pretty much week in week out for the U23s. Especially in the first half of the season. We need to settle into a system, and find a starting line-up which gets the best out of the squad and hopefully the results will come sooner rather than later. Experience won the day, and the team will be champing at the bit to face Carrarese on Monday. Who won their opener 1-5 away to curiously named Arzachena Costa Smeralda (apparently the most expensive place in Europe to purchase property. Rich folk, terrible team). That result was no major surprise given the Sardinian minnows were lucky to avoid relegation last campaign. Whilst Carrarese were involved in the play-offs. 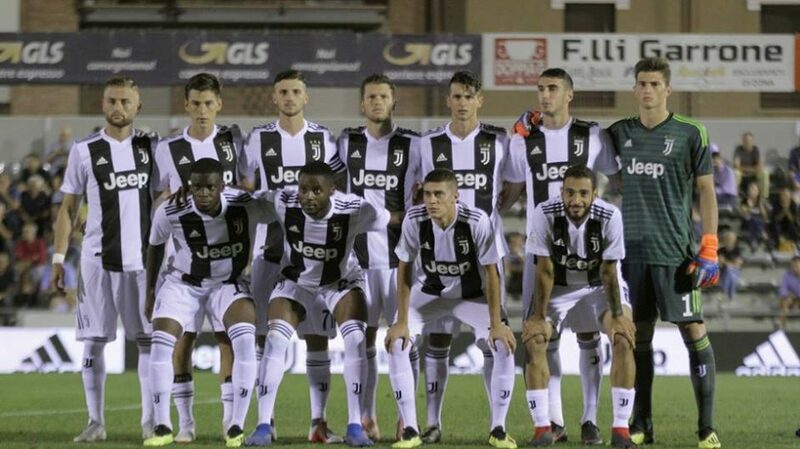 JUVENTUS U23 (3-4-3): Del Favero; Morelli, Andersson, Zanandrea; Toure, Kastanos (30 ‘St Fagioli), Emmanuello (17’ st Muratore), Zappa (17 ‘st Beruatto); Mavdidi, Zanimacchia (30 ‘st Pozzebon), Bunino (9’ st Pereira). Not quite as hoped! Thankfully we have games coming thick and fast with a home tie against Cuneo this Thursday 27th and then away to Novara on Sunday 30th, when captain marvel Alcibiade returns from suspension to add some clearly much needed steel and experience to the back line. First up in the league fixtures was a home tie against Sampdoria. Solid performance all round with Petrelli grabbing the winner. They followed this up with a hard fought 0-1 away victory in the UEFA Youth League (which mirrors the group stage of the seniors squad in the Champions League). Elia is a big lad. Standing 1m86, aged just 17. Which surely helps. Yet there is far more to his game. Blessed with good pace, two good feet, great awareness and an unerring eye for goal, the youngster was signed from Cesena in 2016. Has since progressed beautifully in the youth sector, scoring a phenomenal 36 in 40 games for the U17s. 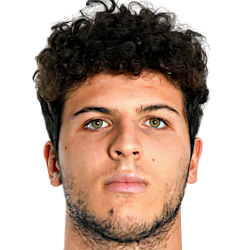 Recently making his debut for the Italian U18 side, scoring in the 2-0 win over Serbia. And promoted directly to the U19 Primavera side, where he has hit the ground running. What I like most about the kid, other than his superb strike rate and impressive hairstyle, is that he seems to play the game always with a beaming smile. He loves his football. All of which combined suggests a very bright future indeed. On Sunday the Primavera returned to league action with a commendable 0-2 victory in Sardinia. Italian U19 central midfielder, Manolo Portanova grabbed both goals. JUVENTUS (4-3-3): Loria; Bandeira (19 ‘st Meneghini), Capellini, Serrao, Anzolin; Portanova (37 ‘st Francofonte), Leone, Nicolussi Caviglia; Baden (44 ‘St Pinelli), Petrelli (37’ St Markovic), Monzialo (1 ‘St Di Francesco). Scorers : 18 ‘pt and 32’ st Portanova (J). 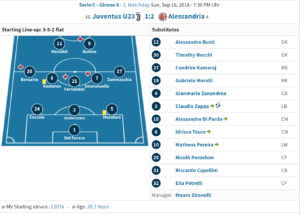 Promising signs for the primavera and very much a work in progress for the fledgling Juve B side.